I had one final nagging question, does a final 90 degree bend reduce the 5th harmonic at 200 Hz? So at long last I cut out a hole of 190 cm2 in the back board and sealed the bottom of the box. Note the opening in the narrow back below the driver. Below is the impedance curves with the two different openings. Frequency response at the pipe end does not change. The measurements are months apart and the old one (blue) with the speaker at a wall and the new with the speaker in the middle of the room (green). That 200 Hz peak sure is persistent! Then I have a new pair of Voigt pipes, designed by late Bosse Hansson of Opus 3 Records. They are designed for Lowther, with 19mm chipboard as the building material and 2x 19mm in front an back they are very different from the flimsy Deccas. Tuning of the pipe is similar. Damping inside the pipes are similar with felt covering the walls of the first half of the pipes. Listening to Adele 21 and some other records the pipes sound quite similar. Playing loud bass and the decca vibrates a lot not only the large front baffle but also the narrow top plate. The other pipe does not vibrate at all or very little. So that 200 Hz peak is not tamed with a new location for the pipe opening. Nor does the flimsy constructions cause the sound to radically different compared to a massive pipe of similar dimensions. The proper reference would be to build a second DCH but in much thicker material as baffle loading and other factors comes into play here. I tried adding braces of OSB or chipboard, screwed and glued see pictures. I measured the pipe output and it was no different than the unbraced. The original HFN&RR article claimed that the removal of the brace for the front panel was a improvement. 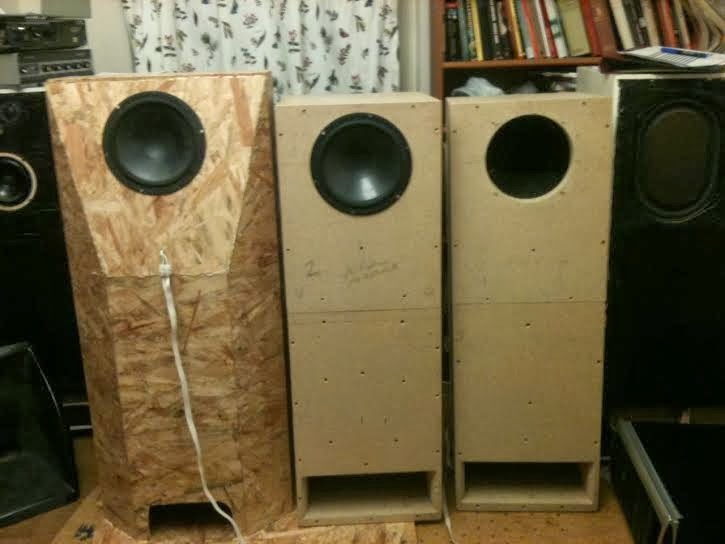 That with a 9mm plywood baffle. Here I ended up with 11mm OSB-wood glue-11mmOSB-silicone glue-12mm asfaboard. 2. Covering the first half of the pipe in felt helps a lot in the time domain by reducing internal reflections around the cone. It probably also give some panel damping as well. 3. The the bracing shows that the original articles claim that the damping is provided by the thin-walled panel vibrations is not true. Building the cabinets in 12mm MDF or even thicker and more wellbraced cabinet should work well. The well behaved original design is more due to geometry and many non paralel walls than the walls functioning as absorbers. 4. Moving the pipe opening to the back of the cabinet does not change neither bass output nor harmonics. Having the opening facing a stone slab or a thick carpet makes no difference. 5. It sounds good, it looks cool and the backward facing position works well with many fullrange drivers that sound forward and shrill when facing forward.